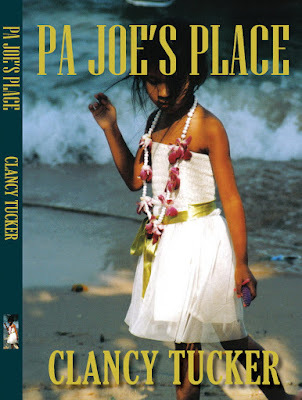 Pa Joe’s Place by Clancy Tucker is sweet story that speaks volumes. At only 8 years old, and with her father dying Boo Nawigamune is sent to live at Pa Joe’s Place, an orphanage far away from her parents and seven siblings. During her journey she survives a train derailment,a snake bite, tsunami and a fire. Never before have I cried my way through a book like I did with Pa Joe’s Place. I cannot remember ever having cried so early in a book with the tears flowing at only chapter three. Within Pa Joe’s Place Clancy Tucker has created a book that moves you page by page. At times I felt that what Boo went through in such a short time was a little unbelievable but at the same time it sat true in my heart and it moved me. I could not do anything but love little Boo. Her strength and compassion as she travels 1700 kilometres from her home to live in an orphanage is inspiring. At such a young age this gifted girl teaches us so much. Pa Joe’s Place is an exceptional novel that is not often seen. It is one of those gems that leaves you reeling with emotions days, weeks, months and years after you have read it. Still many months after I shed my last tear Pa Joe’s Place sits within my heart. As I write this my heart flutters and my stomach feels empty as I vividly recall the journey I traveled with Boo. I feel the loss of Boo as though she was a child of my own. Pa Joe’s Place is a cultural journey through Thailand were the reader meets the people, the culture and the environment. It educates and it inspires. I cannot speak words powerful enough to do the content of Pa Joe’s Place justice nor the spiritual journey that it takes you on. Pa Joe’s Place gave me hope. It made me smile and it inspired me to be the best person I could be. I met Boo Nawigamune in 1973 when I was dealing with the death of a very close friend. Boo reached out and we became the closest of friends. To this day, she is still the most gifted and compassionate child I’ve ever met. I was the lucky one. Our world would be a far better place had she lived longer. Sadly, Boo died of leukaemia, but she was happy and focused until the end - a magnificent kid. What you saw was what you got - pure sunshine. Within Pa Joe’s Place Clancy Tucker does Boo proud.There could be no better tribute to a little girl with a pure heart of gold. The deep love, understanding and friendship that Boo and Clancy had shines throughout Pa Joe’s Place. I will continue to carry Boo Nawigamune with me in my heart as though I knew her personally. When times are tough I will remember the journey of a little girl that showed so much strength and courage. I smile as I think of her name. I share the kindness toward others on behalf of Boo, a little girl who’s short time on earth touched so many. Boo wanted to change lives and today she continues to do so through the writing of Clancy Tucker.